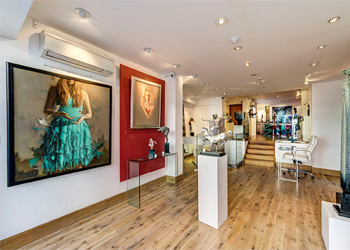 The property is situated on the western side of Kensington Church Street, to the south of Notting Hill Gate and close to the junction with Campden Street; adjacent to the famous pub and tourist attraction The Churchill Arms; opposite Sally Clarke’s Restaurant and close to Sally Clarke’s Shop. This section of Kensington Church Street is famous for its antique and art galleries with many leading names represented. View location map. A new effectively full repairing and insuring lease is available for a term of 10 years at an initial rent of £65,000 per annum exclusive, subject to five yearly upward-only rent reviews. EPC and recommendations available on request. The local authority has verbally informed us that the rateable value for the premises is £20,250 and the rates payable for the current year ending 31/03/15 are £9,537. Interested parties should make their own enquiries and confirm: - Royal Borough of Kensington and Chelsea business rates department 020 8315 2082.